At All American Landscape & Masonry, we have been known for the personal touch that we render in all our offered landscaping services. We have served countless clients in the Middletown, Portsmouth, and Newport areas, making us one of Rhode Island’s most reliable and respected companies. Our goal is to make clients like you fully satisfied with the dedication and craftsmanship that we pour into each project. If you wish to have a standout property or if you want to hear the various landscape options that we have for you, then contact us soon. Plantings provide a relaxing touch to any landscape, be it a commercial space or a private property. Accordingly, we can provide various species of annuals, trees, perennials, shrubs, vines, and groundcover that are proven to thrive well in Middletown and other areas in the state. These plantings are guaranteed to make any outdoors more inviting, cooler, and more stunning. Trees. We can plant hickories, white pine, oaks, maple, ash, birch, walnut, and cedar. Other great tree species for Rhode Island landscapes are poplar, juniper, and fir. Shrubs. From sweet fern and lowbush blueberry to cranberry and arrow-wood, we can provide your desired native shrubs straight from our partner nurseries. Vines and groundcover. We can plant native vines and groundcover, such as trumpet honeysuckle, cow vine, virgin’s bower, and Virginia creeper, as well as other species that you desire. Perennials. Our recommended perennials include asters, iris, lilies, swamp milkweed, pearly everlasting, harebell, and many others. Aside from various plantings, we can also install other landscape amenities, such as water features (pools, ponds, fountains), walkways, sitting areas, garden steps, fire features (fire bowls, fire pits, fireplaces), and the like. 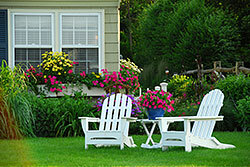 These outdoor features will make your landscape fully functional and more relaxing to stay. 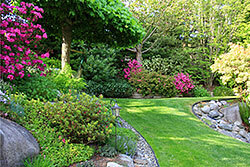 What Makes Our Landscaping Services Exceptional? For years, we have continuously strived to be the best at what we do. Consequently, we have earned a reputation as experienced and competent landscaping contractors in the areas that we serve, particularly in Middletown, RI. Our work quality speaks of our desire to provide property owners with the results that they deserve. This is why we always prepare a well-thought-out plan before proceeding with the actual installation of landscape elements. This ensures harmony and balance of all concrete structures and softscapes. We also have long-standing partnerships with the best nurseries, as well as the most trusted manufacturers and suppliers of top-notch landscaping materials, letting us come up with unique landscapes complete with our clients’ dream amenities. Meanwhile, we employ only skilled and dedicated landscape installers who share our vision of rendering honest and affordable professional landscape installation services. On the other hand, our complete set of tools and equipment allow us to complete our projects on time and based on clients’ specifications and design. Ultimately, we can guarantee you of a well-appointed landscape that you can truly be proud of and enjoy for a lifetime. Call us today at 401-619-5296, and let us address all your landscaping concerns.